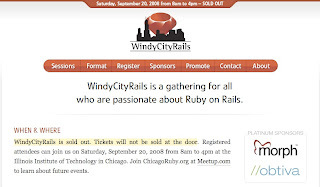 Rails is coming up big in the Windy City on the 20th of September. So if you were planning to attend but do not have a ticket yet, I've got bad news and good news for you. Bad news is that there are no more tickets. Nada. None even if you show up on the door come event time. Good news is Morph Labs is giving you a chance. Just go here and subscribe to the Morph newsletter in the lower-right corner. Then, send an email to Manuel letting him know that you have signed up and that you would like to be considered for the drawing. Three names will be randomly chosen from all who enter. Good luck. Forget about Chrome for now and try Navigaya, instead! I'm getting the hang of using socialmedian. Now they are getting an upgrade about newstreaming. Read more about it here. You have a good software you plan to offer online? Remember, it won't sell itself so you better roll up your sales sleeves and work on it says the Wall Street Journal. Here's help for entrepreneurs from Stanford. School of Everything. What we need more of. Or maybe it's too early for this. Drive Backup 9 Express. So you won't wring your neck because of lost PC data and stop lusting over Time Machine. More importantly, it's also free! Early adopter debate. Haven't read anything like this in a while. Fiery comments, not for the faint-hearted. Besides the planet, do you know what's dying? This one's got the stats to prove it. Print newspapers.